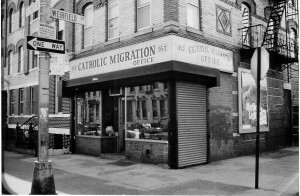 Catholic Migration’s original storefront office at 952 Seneca Avenue in Ridgewood, Queens. In 1971, the Most Reverend Francis J. Mugavero established the Catholic Migration Office in response to the 1969 Papal Instruction Pastoralis Migratorum Cura, written by His Holiness Pope Paul VI on the Pastoral Care of People who Migrate. The office was the first of its kind in the United States and sought to serve the needs of immigrants and refugees living in Brooklyn and Queens. Since then, the agency has served tens of thousands of immigrants regardless of race, religion, ethnicity, national origin, or immigration status. Those served represent at least 167 countries where individuals collectively speak more than 80 languages. From a small storefront office, Catholic Migration Services has grown to become one of the city’s most respected and effective organizations serving immigrants, with offices in Downtown Brooklyn, Bushwick and Sunnyside, Queens. The first Apostolates were established in 1972 to meet the unique needs of the Italian, Haitian, Polish, Korean, Croatian, and Spanish communities in the two boroughs. In response to the 1986 Immigration Act, Catholic Migration played a major role in developing the Diocesan Legalization Program, through which over 20,000 immigrants from 68 countries applied for legal temporary protection. This program was recognized as one of the largest in the country. In the 1990s, 12 additional Apostolates were established to meet the needs of the Brazilian, Filipino, Ghanaian, Indian, Indonesian, Nigerian, Pakistani, Romanian, Russian, Vietnamese, and West Indian communities. Currently, the Diocese of Brooklyn is home to over 30 ethnic ministries representing immigrant communities from across the globe. In 2004, Catholic Migration partnered with Fidelis Care to establish the Health Education Program which offers free multilingual information on immigrant rights to healthcare access and services. The following year, the Immigrant Tenant Advocacy Program was established to address housing abuses and provide free legal representation for immigrant tenants. In 2009, the organization established the Immigrant Workers Rights Program, which operates Línea Laboral, a toll-free hotline and call center for immigrant workers to address unsafe working conditions, wage and hour violations, and other workplace concerns. In recent years, Catholic Migration transitioned from the immigration services arm of the Diocese of Brooklyn to become an independent not-for-profit corporation, altering its name from “Catholic Migration Office” to “Catholic Migration Services.” The dedicated staff of Catholic Migration Services continues to assist and provide crucial services to immigrants living in Brooklyn and Queens, always respecting them as persons who should be welcomed.